It’s important to establish yourself now on social networking sites. 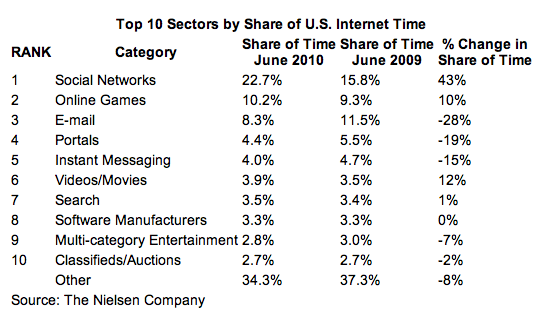 For starters, users are spending increasingly more of their time on social networks, even when they’re on the go. Also, you need inbound links to improve your page rank. And you need to attract new audiences. 3 good, powerful reasons that illustrate the value. According to a new poll released by the Neilson Company, Americans spend almost 23 percent their time online on social networking sites, up from 15.8 percent last year (a 43 percent increase). This is almost triple the amount of time spent on email activities. In a Nielsen survey of mobile web users, there was also a double-digit (28 percent) rise in the prevalence of social networking behavior. With these statistics in mind, take a look at the well established brand American Quarter Horse Association. They are a great example of using social networks to the fullest to increase website traffic. AQHA uses Facebook and Twitter to connect with users, to link to their AmericasHorseDaily blogs and promote interest in their online store and print publications. They also upload video on their own YouTube channel. All of this contributes to a strong web presence and improves branding – which leads to increased website traffic. What’s the real value of those inbound links? Basically, it can be likened to a popularity contest. The more links you have, Google believes the more popular you are and rewards you with a higher page rank. How do you get more links? That takes us right back to social networking. And remember, Google likes to see that you play well with others. Do you link to other blogs and sites? If not, how can you expect others to link to yours? Let’s face it – online users can be finicky. Today they need you, they love you, your website and all that it stands for. Tomorrow their needs change and they unsubscribe. Disappointing? Yes! Unexpected? No, but you do need to replace them or you’ll be out of business fast. Yet another good reason to use social media is to attract new audiences. Some users may not have stumbled upon your site if it weren’t for a tweet that caught their eye or if a friend hadn’t “liked” your page on Facebook. An example: At Purveyors General, most Wednesdays are White Paper Wednesday. They promote it first to their email subscribers and then in their Twitter feed and Facebook page. Not surprising, a good majority of their new email sign-ups come from those Wednesday tweets and Facebooks that introduce their followers to a new white paper on their website. All of this together contributes to increasing website traffic. In turn, that increases the number of email subscribers, ultimately allowing you to have a “farther reach.” And isn’t that a very good thing? If you want to get started on your business’ social media presence, contact us for a complimentary consultation. We will either do it for you, or we’ll get you started and show you how to run from there! Facebook, LinkedIn and Twitter are the 3 platforms we provide assistance with.